Facts about the History of Clothing and regalia of Native American Indians and information about Deerskin. Native Indians hunted deer to provide not only food but also clothing for the people of the tribe. Deerskin was therefore one of the most important elements of Native Indian life. To make deerskin clothing the hide was removed and various processes were applied such as scraping, smoking, softening, stretching, dyeing and decorating the deerskin hide. The quality and use of deerskin was quickly recognised by pioneers, frontiersmen and traders. Trading in deerskin replaced fur trading. A deerskin was worth a dollar to traders and the dollar became referred to as what it was worth - a "buck". 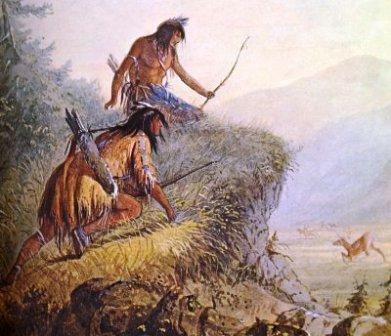 Deerskin Fact 2: Hunting methods included the use of the bow and arrow, and later the gun, together with setting deer traps. Deerskin Fact 15: Trading: The fur trade, especially beaver, dominated trade in the 1600 and 1700's to meet the need for producing fashionable high quality felt, suitable for hat making. In the 1800's fashion changed and as the beaver trade declined the trade in deerskins boomed as leather hats became fashionable.